The end of my first full year of living in Boston and what a year it’s been. It should come as no surprise that the highlight of the past year was the publication of my first book in June. I’ve always loved the social aspect of doing history, whether its teaching in the classroom, working with history teachers or lecturing in public. I’ve met some wonderful people this year and I thank each and every one of you for purchasing a copy. Based on the few notices I’ve received from the publisher it looks like sales have been brisk. I am hoping that my royalty check at least allows me to take my wife out for a really nice dinner next month. As for 2013 I am looking forward to working with the Massachusetts Historical Society on some programs for teachers as well as the Massachusetts 150 Commission. On the writing front I am hoping to complete the Confederate camp servants book and finish up with editing the letters of Captain John Christopher Winsmith. We shall see. For now I want to thank all of you for continuing to visit Civil War Memory. It’s hard to believe that I’ve been at this thing called blogging for over seven years now. Happy Holidays to you and your family. …and now to the list. Best Civil War Blog: Brooks Simpson’s Crossroads came swinging right out of the gate when if first appeared in December 2010. It quickly established itself as one of the leaders in the Civil War blogosphere. Brooks holds nothing back and does not suffer fools lightly. Crossroads is incredibly entertaining, but that would mean little if it didn’t deliver solid content. And that it does. Brooks’s sharp wit and thoughtfulness is a lethal combination that has entangled a host of characters over the past two years. What keeps me coming back, however, is the chance to read and interact with one of the brightest historians currently working in the field of Civil War history. 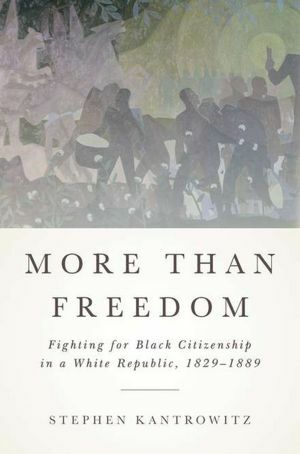 Best General History: Stephen Kantrowitz, More Than Freedom: Fighting for Black Citizenship in a White Republic, 1829-1889 (The Penguin Press). Best Overall Civil War History: Allen Guelzo, Fateful Lightning: A New History of the Civil War and Reconstruction (Oxford University Press). Best Campaign/Battle Study: Mark K. Dunkelman, Marching With Sherman: Through Georgia and the Carolinas With the 154th New York (Louisiana State University Press). Best Regimental Study: Lance J. Herdegen, The Iron Brigade in Civil War and Memory (Savas-Beatie). Best Biography: Jason Emerson, Giant in the Shadows: The Life of Robert T. Lincoln (Southern Illinois University Press). Honorable Mention: Brian Steel Wills, George Henry Thomas: As True As Steel (University Press of Kansas). Best Confederate Study: Yael Sternhell, Routes of War: The World of Movement in the Confederate South (Harvard University Press). Best Union Study: Louis Masur, Lincoln’s Hundred Days: The Emancipation Proclamation and the War for the Union, (Harvard University Press). Best Slavery Study: David S. Cecelski, The Fire of Freedom: Abraham Galloway and the Slaves’ Civil War (University of North Carolina Press). Honorable Mention: Jim Downs, Sick from Freedom: African-American Illness and Suffering during the Civil War and Reconstruction (Oxford University Press). Best Social/Cultural History: Megan Kate Nelson, Ruin Nation: Destruction and the American Civil War (University of Georgia Press). Best Myth Buster: Glenn David Brasher, The Peninsula Campaign and the Necessity of Emancipation: African Americans and the Fight for Freedom (University of North Carolina Press). Best Edited Collection: John Stauffer and Zoe Trodd eds., The Tribunal: Responses to John Brown and the Harpers Ferry Raid (Harvard University Press). Honorable Mention: Hampton Newsome, John Horn, and John G. Selby eds., Civil War Talks: Further Reminiscences of George S. Bernard and His Fellow Veterans (University Press of Virginia). Some good things to look forward to in 2013: Gary W. Gallagher, Becoming Confederates: Paths to a New National Loyalty (Mercer University Press); William Link, Atlanta, Cradle of the New South: Race and Remembering in the Civil War’s Aftermath (University of North Carolina Press); Caroline Janney, Remembering the Civil War: Reunion and the Limits of Reconciliation(University of North Carolina Press); Ari Kelman, A Misplaced Massacre: Struggling over the Memory of Sand Creek (Harvard University Press); Christian Spielvogel, Interpreting Sacred Ground: The Rhetoric of National Civil War Parks and Battlefields (University of Alabama Press). As a novice to this blogging world, my favorites are hosts; Brook Simpson, Kevin Levin, Robert Moore, Andy Hall, and Brett Schulte. Most for their Civil War content, others for their lively debate and all for what Bummer has learned from their ability to communicate rationally to a student like Bummer. Being able to chuckle at their postings, while at the same time anticipating a pending debate, makes the learning experience a sincere pleasure. What books to study, is another aspect unto itself. Bummer takes most of the recommendations and jumps in with both feet. As long as one of my mentors suggests it, that’s good enough for the “old guy”. Thanks for all your patience and advise. Have a great holiday season. Great list, Kevin. I agree with much. I think you ought to consider a spot for Scott Hartwig’s recent To Antietam Creek and also Volume 2 of The Maryland Campaign by Ezra Carman and Tom Clemens. I’ve heard great things about both books, but I can only evaluate books I have read. Hartwig’s massive book just came out. Hi Kevin — Since you’re so close by, I hope you’ll check out Our War: Days and Events in the Fight for the Union, my new book on New Hampshire’s Civil War experience. An innovative take, I think. I’m also blogging at our-war.com. I am new to it (though I had a general blog for a couple of years as editor of the Concord Monitor before my retirement). Your blog is fun and sensible — one of the best of the several I am now following. I enjoy the reading lists. I too loved the biography of Abraham Galloway. Another person to add to my pantheon of Civil War-Reconstruction heroes. Finished Antietam’s book on the farms of the battlefield back in the fall. Read George Shackelford’s George Wythe Randolph and the Confederate Elite which is older. I was worried it may be a praise Randolph book but I thought it was pretty even handed in treatment especially considering the loss of many of Randolph and his wife’s papers due to fire. Got Ronald Coddington’s African-American Faces of the Civil War which had some fascinating stories. One individual he had previously posted about on Disunion I am turning into an interpretive program at the battlefield this summer. I finished your book Kevin. Continued thanks to you for the use of the photo of me at the Crater. Of course I have read your longer M.A. manuscript prior to the publication of the book which I enjoyed, btw not just because I was in it. Recently I’ve spent a lot of time doing primary research which has taken me into a deep obsession with the U.S. Sanitary and U.S. Christian Commissions. So I have to say that the U.S. Sanitary Commission Bulletins and Charles Janeway Stille’s History of the Christian Commission are some of the best things I’ve read all year. Not directly related to the Civil War but this year I continued to work through Defying Dixie: The Radical Roots of Civil Rights, 1919-1950. I can’t say I am making much progress. So many Communist acronyms but I still think it is going to be rewarding should I ever finish. I just picked up _Fire of Freedom_ from the biography shelf at the library and am astonished by how much I didn’t know. I’m glad you have read the book and found it valuable. It fits right in with some aspects of the Civil-War-in-Boston symposium at the Mass. Historical Society next week (early April 2013). Previous post: What Did You Read This Year?